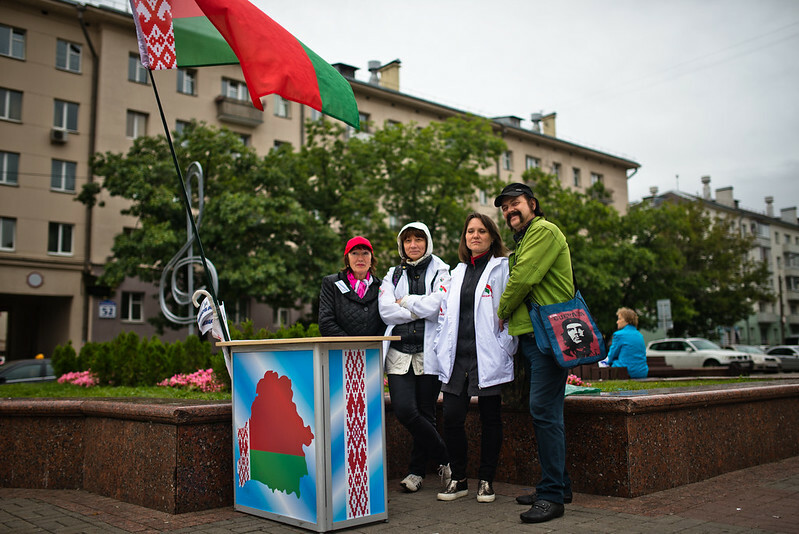 A campaign stand of Belaya Rus‘ members in front of Minsk concert hall. Belarus is a unique case in the post-Soviet space: Contrary to all its neighbours, political parties are nearly absent in daily life and they do not play any role in the decision-making process. This situation dates back to President Alexander Lukashenko’s takeover of the power in 1994. Since 1 August 2016, candidates running for the parliamentary election have been out campaigning. Out of the 488 current applicants who are fighting to win a seat in the House of Representatives – the lower house of the parliament of Belarus – nearly two thirds were nominated by a party, while the rest claims to be „non-partisan“. These figures might give the wrong picture, however: While after the 1996 parliamentary election 49 out of 110 deputies belonged to a party, after the parliamentary elections in 2012 the number was down to only 5, all pro-governmental (three of them representing the Communist Party of Belarus, one the Republican Party of Labour and Justice and the other the Belarusian Agrarian Party). The majority of the other „independent“ deputies have been working for state agencies or regional administration, meaning that they originate directly from the state machinery, which is dominated by the president. The majority of parties only exist on paper or are more or less a one man show, and just 15 are officially registered. Furthermore, no new political party has been registered since 2000, predominantly because the authorities regularly reject the registration of oppositional parties such as the Belarusian Christian Democrats. Their last and sixth attempt at registration failed in January 2016. The reasons for this eroding party system lie in the establishment and consolidation of the authoritarian regime under President Alexander Lukashenko. When he came to power 22 years ago, he did so in the context of an unstable and fragmented party system. He used this opportunity to increase his power while systematically discrediting parliament and political parties – both institutionally and rhetorically. Behind the President’s rant lay a greater power struggle with the previous parliament, known as the Supreme Soviet. In Autumn 1996, this quarrel was settled by a positive referendum on constitutional amendments, initiated by Lukashenko himself. The constitutional change reduced the size of the Supreme Soviet and gave the president the authority to dissolve the assembly at will and provided him rule by decree. He replaced the previous parliament with a bicameral system. This change quickly diminished the role of the briefly extant Belarusian legislative body. Since then, the constitution has strictly limited parliament’s control of the executive; its members can barely influence the appointment and dismissal of the government and ministers. In short: The „parliament has been emasculated“ and is simply „basically rubber stamping laws“. Besides the non-existent balance of power, the voting system has also led to the almost complete absence of parties in the Belarusian political system: Members of the Lower House are elected from 110 single-member constituencies. In general, this system of absolute majority election undermines the possibilities for meaningful party affiliation. Lukashenko’s main goal was to de-politicise wide swathes of the Belarusian population and therefore to limit any basis for the opposition. He also delegitimised and undermined the institution of a party while introducing rigid laws concerning assemblies and political parties. For example, he prohibited anonymous donations and introduced the need for all parties to comprise at least 1,000 members. By limiting potential opposition, the President tries to avoid the emergence of parallel power structures. Thus, parties and political organisations have been forced to go underground, thereby ending their contact with ordinary people and leading to their marginalisation. „Unlike other countries, Belarusian parties do not provide social opportunities, personal status or business contacts. In addition, the majority of Belarusians do not believe that party membership will have an effect on whether or not a party will achieve its goals“, writes political scientist Tatsiana Kulakevich. As a result, political parties nowadays are more political clubs with mostly only several dozen active members. Even the three pro-governmental parties of the present parliament „mostly stay unnoticed by the general public“, sums up political analyst Yauheni Preiherman. A notable exception is Belaya Rus‘ ‚White Rus‘: This Belarusian public association was founded in November 2007 to support Lukashenko, based on the idea of the Russian party Yedinaya Rossiya ‚United Russia‘. In contrast to its Russian counterpart, Belaya Rus‘ has not yet been transformed into a „party of power“, despite nearly half of the current deputies being members. Paradoxically, then, the longer and more present Belaya Rus‘ becomes, the more likely we are to see a presidential U-turn. This article was first published on “Belarus Votes 2016”.